We hope everyone had a great Christmas and we’re looking forward to a great New Year, full of lots of water time and upper-slot fish. Hopefully this month you will get to try out some of that new tackle you got. I guess the most common comment this month was: “HUH? 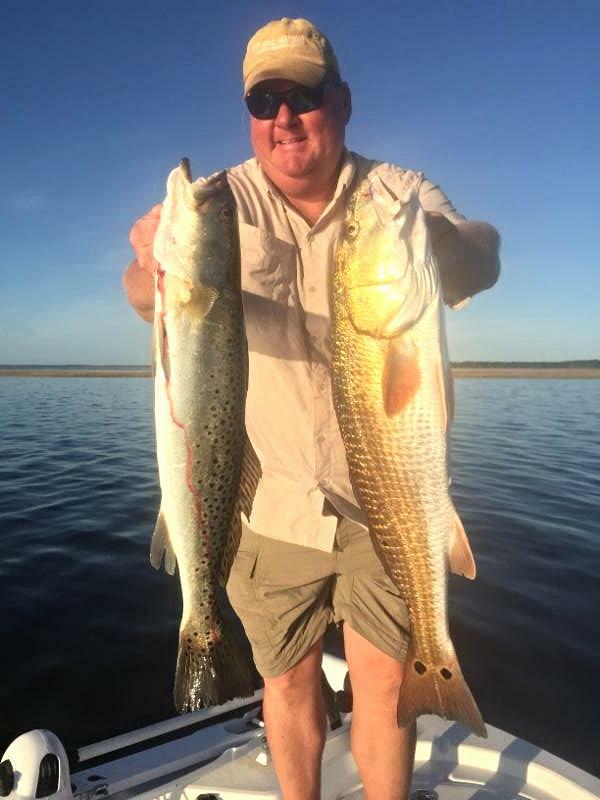 Why is it 82 degrees on Christmas Day?” Unseasonably warm temperatures the entire month caused the expected confusion among our trout population, with springtime temperatures moving them onto the flats, looking for quick meals before the hammer from the north comes down. Trout have been caught in the river…but at this time most are undersized. 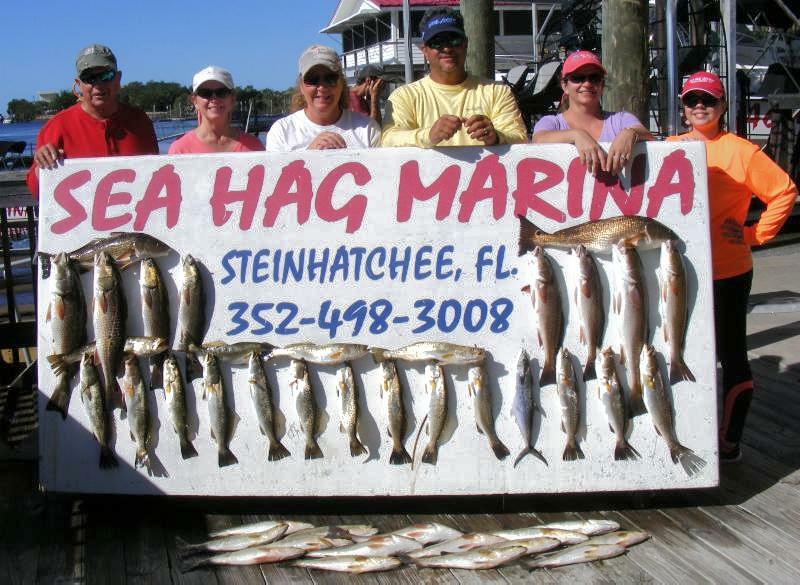 Pepperfish Keys still provided a lot of trout limits in the deeper channel to the west, and trout and redfish around some of the shorelines to the northeast of the islands. And some nice reds were also taken north of Fisherman’s Rest toward Big Grass Island. 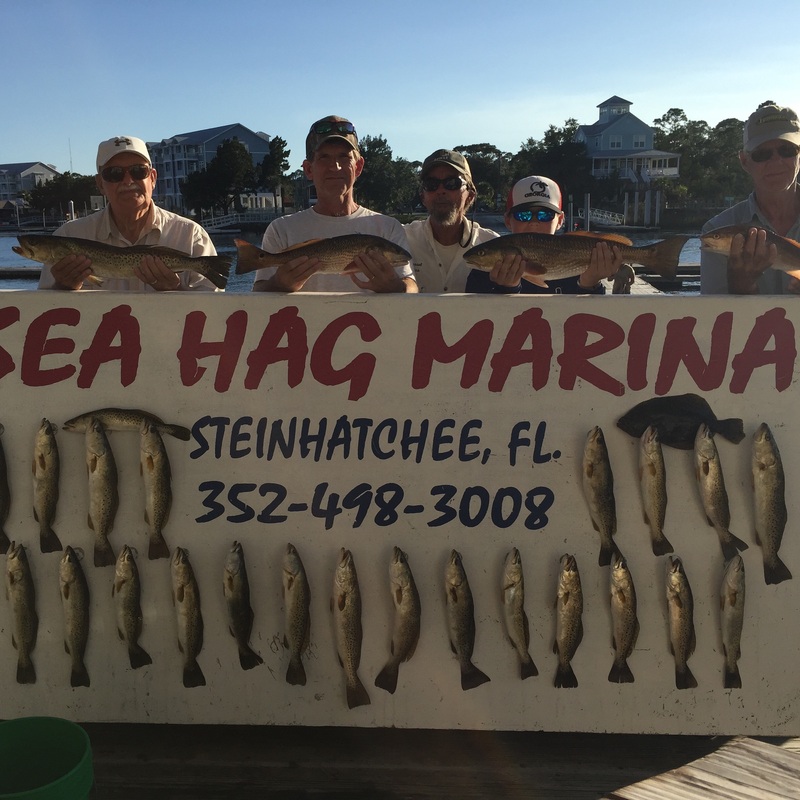 Here are some pictures with just a few of this month’s catches. Fishing with Doug Barrett, I had to celebrate a nice redfish with a high quality cigar. 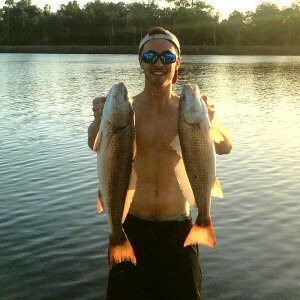 Taking advantage of the warm weather, Cameron Swager caught these nice redfish near the river. Jackson Forrester caught his first redfish on a live Sea Hag shrimp. and with brother Will brought in these nice trout limits with reds and Spanish mixed in. Tyler Thurmond with this upper-slot redfish caught at Pepperfish Keys. 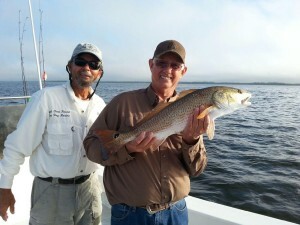 Sarah Gorges caught this fine redfish fishing with Randall Hewitt. 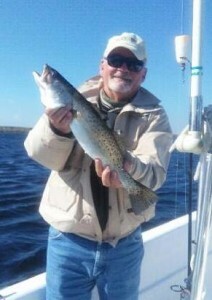 Steinhatchee master Max Leatherwood with a true gator trout, which he released. 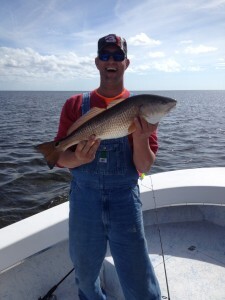 Tommy Ballard with a very large pairing of a redfish and a trout. 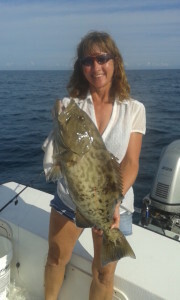 Captain Crystal with a late-season gag grouper. …and a big bluefish in the river. Derek Simpson with a fine example of a very tasty black sea bass. Bill Rees and family with a giant board full of fish. 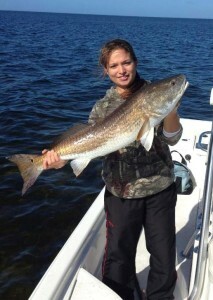 Brittney Robinson had to let this giant redfish go. 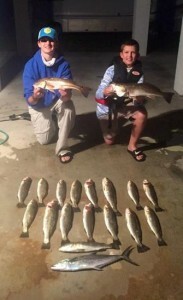 In spite of cold temperatures, serious fishermen love the winter months. 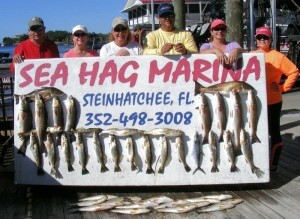 Inshore, the big anticipation is the arrival of trout in the river. At times during December, some fine trout were caught in the river, so it’s only a matter of time before schools move into the river and the channel will be full of anglers. Fishing the Steinhatchee River during a winter trout run is great fun, once you get used to the fact that the river will be jammed with boats. Courtesy is important, and spend some time anchoring appropriately so that you are not in the channel. 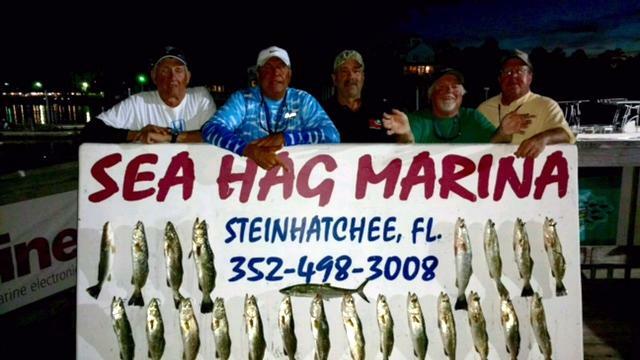 This can be a challenge, because most of the fish are found in the channel and deeper water around it. 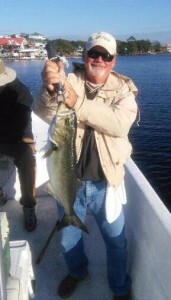 Additionally, the best fishing is frequently near the mouth of the river between markers 19 and 26. As the temperature gets colder, into the 30’s, the fish may move further upriver. One way to locate fish is to slow-troll the classic 52M Mirrolures in the channel. When you find one, pull to the side of the channel and anchor carefully. 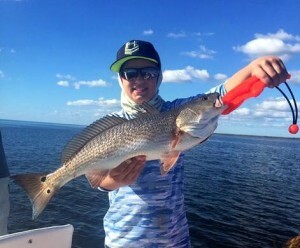 I’ve always found river fishing to be most productive either casting sinking plugs such as the Mirrolure Paul Brown or Sebile lures (which have developed a fantastic reputation for cold-water fishing), free-lining live shrimp with some split-shot to keep them near the bottom, or ¼ oz. jigheads with Gulp tails or DOA shrimp in the ¼ or ½ oz. size. Attach them with light fluorocarbon leader. 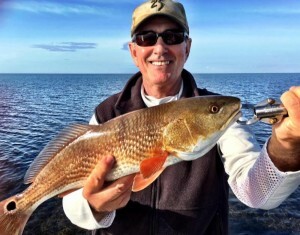 Throw your lure or bait upcurrent into the channel and allow it to sink as deeply as possible, working the plugs with nothing more than the occasional twitch. Remember that much of the area that holds the most trout is also the rocky part of the river, so be prepared to lose rigs on the bottom. Trout in the river are frequently variable in size; I’ve caught some 26 inchers right next to short fish, but remember that regulations are enforced year-round, and you may very well be checked for short fish. 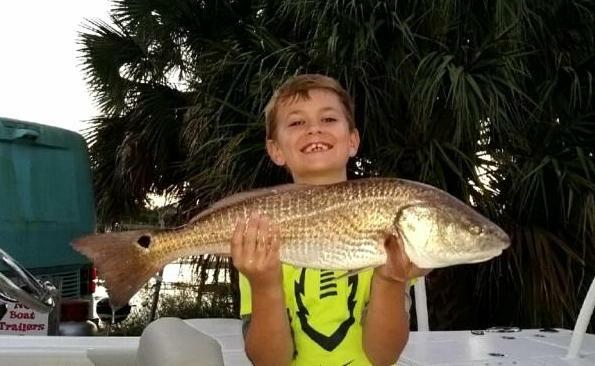 Because of shrinkage, it’s wise to only keep fish that are nearly 16 inches in length, just to give yourself some leeway; short trout can make for a very expensive meal. Fishing with shrimp, you may also find some nice croakers, black drum and redfish in the river rocky areas. 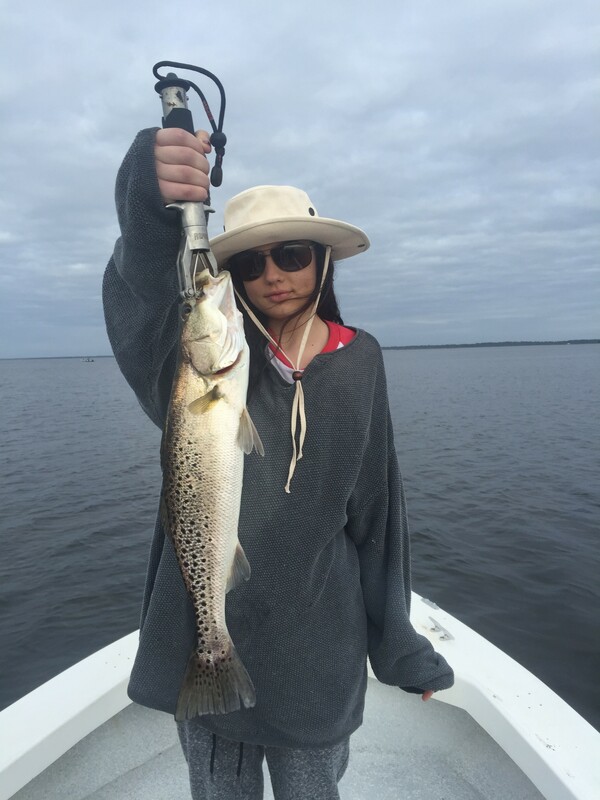 Finally, while river fishing is easy in almost any weather, and there are keeper fish available, those with local knowledge understand that winter is the best time of year for trout over 20 inches. 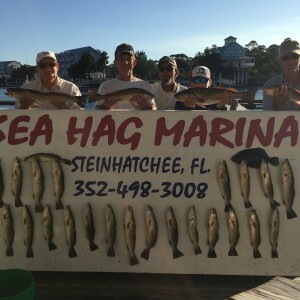 Sunny warming afternoons on flood tides in areas of rocks or dark bottom is a great way to start, but key trout locations are guarded jealously by those in the know. 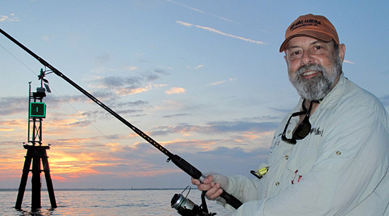 And no matter where you fish, remember: in cold water, slow down everything. Fish everything as slowly as you can, and then cut that in half. Offshore, in federal waters gag grouper will remain closed, but red grouper will re-open after being closed since October. 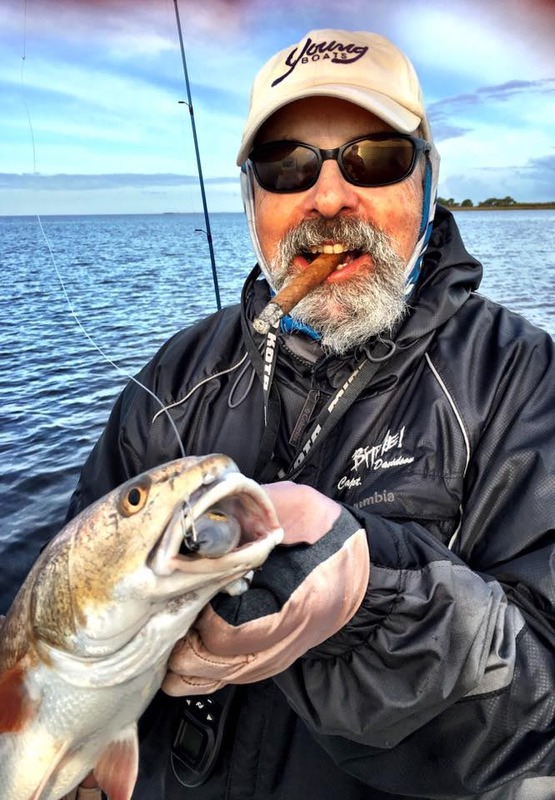 Amberjack are available as of January1….BUT there is a change in minimum size limit: AJ’s must be 34 inches fork length to keep (up from 30 inches). 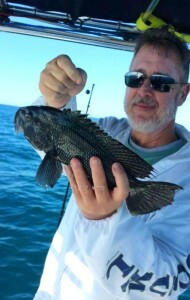 This is also a great time of year to target one of the best eating fish in our area, large black sea bass. They are spawning and the larger males are hungry on offshore structure. Meanwhile, we can look forward to sheepshead season which is just around the corner. We wish everyone the happiest of New Year fun and fishing. What a crazy so called winter! 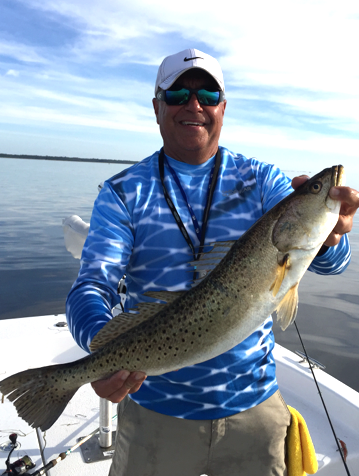 With water temperatures still in the 60’s the Trout continue to inhabit the shallows feeding on Shrimp & Pin fish. Lots of action on the flats! 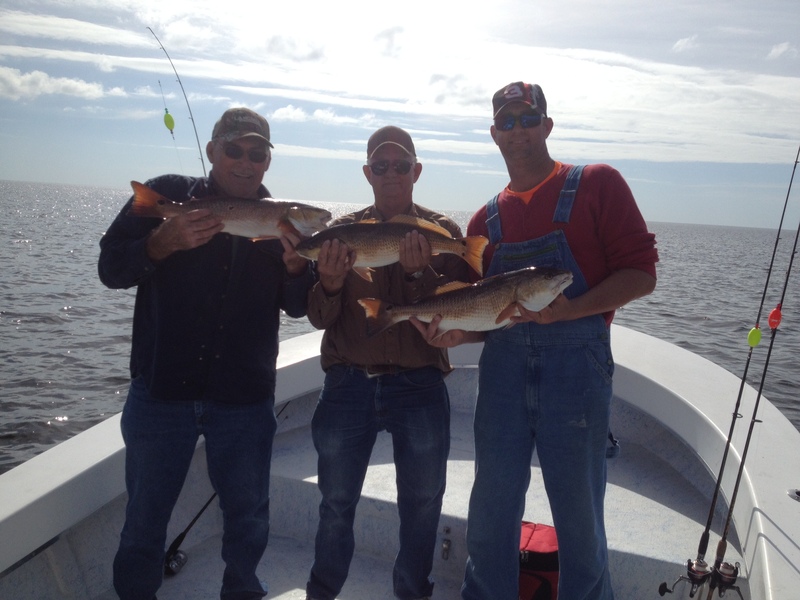 Redfish still around too. It will not be long though before the Pin fish leave the flats & the Trout will follow to deeper waters. With weather like this it’s time to go fishing!